PR Antique Products uses only reclaimed wood salvaged from century old barns. Whether planed down or gently sanded, this reclaimed wood has a unique look and rich patina that only aged wood can give. A green source of hemlock, pine, elm, beech & ash used to make wide plank barn board floors, stairs & trim. The wood is dappled with nail holes and evidence of its history can be seen in every imperfection. It is this very imperfection, which makes each floor, stair tread or trim piece one of a kind. We are a Canadian company located in Meaford, Ontario using a renewable resource to make your house a cozy place to come home to. 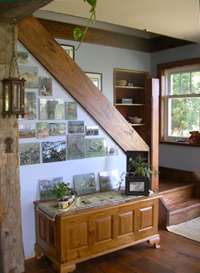 Learn more about reclaimed wood or browse our photo gallery to view some of our work.